Girls | Just Add A Kid Girl Baby Bibs, Onesies, Infant Tees, Toddler Tees, Youth Tees, Adult Tees, Infant T-Shirts, Toddler T-Shirts, Youth T-Shirts, and Adult T-Shirts. Fly like an Ace in this "Air Force Pink" t-shirt Hangout with all your wild life buddies in this cool "Alaska Friends" t-shirt Listen for the call of the wild in this "Alaska Friends Loon Girl" t-shirt. Hangout with all your wild life buddies in this cool "Alaska Friends" t-shirt Go intergalactic with this cool "Alien Creature" t-shirt. 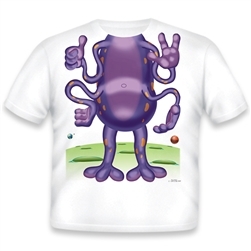 Cruise from planet to planet in this "Alien" toddler t-shirt and sock combo. Get them going with this "American Cheerleader" t-shirt. Soar high and proud with this "American Eagle Rider Girl" t-shirt. Show them where you come from with this "American Made African Girl" t-shirt. Show them where you come from with this "American Made Asian Girl" t-shirt. Show them where you come from with this "American Made German Girl" t-shirt. Show them where you come from with this "American Made Irish Girl" t-shirt. Show them where you come from with this "American Made Italian Girl" t-shirt. Show them where you come from with this "American Made Mexican Girl" t-shirt. Be the winner with this "American Medal" t-shirt.